Ah the sweet smell of pumpkin pie and chocolate sneaking out of the oven. Doesn’t get much better than that! Hope everyone had a great weekend. Busy busy busy as usual around here with the boys sweaty soccer games and lots of running around. I was cracking up at the movie theater Friday night. My girlfriend and I went to see “Fame” and couldn’t help feeling so old! We were the only ones in the entire theater that wasn’t cheering and clapping throughout the various parts of the movie. At least it was entertaining, guess I’m just a teenie bopper at heart! Another simple Fall lovin’ recipe for you today. It’s a fabulous way to jazz up that trusty box of brownie mix you’ve got laying around the pantry. Swirl in some of my pumpkin pie recipe and out comes this gorgeous, looks like you’ve slaved all day in the kitchen, little slices of heaven. Top each slice with some cinnamon spiced cream cheese and you are good to go. Enjoy! 1. Preheat oven to 350 degrees F. Unroll pie dough from packaging and press into 2 tart pans with removable bottoms or 2 pie pans work just fine too. If you are using a pie pan make sure it’s not a deep dish style, the brownie mix will not fill to the top. With a fork, poke holes into the bottom of each crust then bake the pie crusts for 15 minutes then remove from oven. Prepare each brownie batter according to package directions. Pour each of the mixes into your tart or pie pan. 2. In a large bowl beat the pumpkin, sugar, milk, cinnamon, nutmeg and egg until well combined. 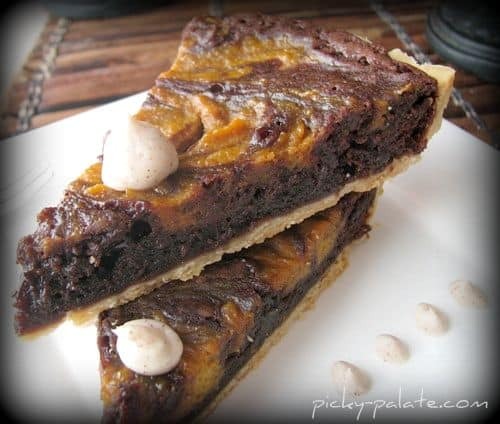 Divide into 2 equal parts and dollop spoonfuls over each brownie pie. Take a knife and carefully swirl pumpkin pie into brownie batter without over swirling. You should see swirls. Be careful not to run your knife too far down tearing the crust. Bake for 35-38 minutes or until a toothpick comes out nearly clean when poked in the center of the brownie pie. Remove and let cool completely before slicing. 3. In a large bowl mix the cream cheese, powdered sugar, milk and cinnamon until smooth and creamy. Place dollops over each slice of pie. Serve with a tall glass of milk, enjoy! Have a wonderful new week, come back soon with another Pumpkin recipe that’s oh so good! You are so right about that “trusty box of brownie mix” I keep around for emergencies. Usually end up throwing it out but think I’ll keep this recipe handy to jazz it up. That swirl is MESMERIZING!! Love it. Yumm! This looks so good. 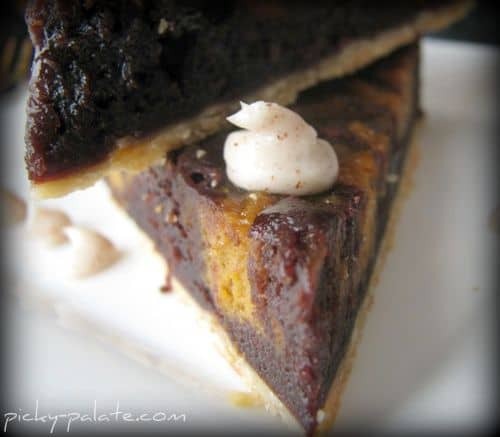 I just started really enjoying pumpkin pie and other desserts…this looks amazing! Maybe I can make a pumpkin convert of my husband with this brownie! 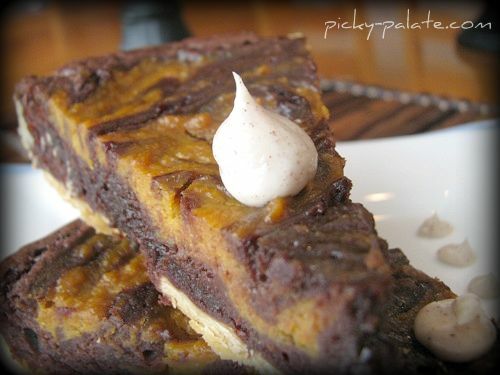 Brownie and pumpkin sounds like a great combination! As always, you have the BEST recipes! WOW! That’s the best way to describe this! This looks incredible!!!! Just when I think you’ve come up with the best thing ever, you post something like this! LOVE IT! Holy cow! I’m so excited! I hope to make this next weekend- you can’t have too many pumpkin/fall recipes!! Do you think it would be just as good with homemade brownies (I used my last mix already. haha)? What would be different if I made them homemade? It’s official. You are dangerous. I see why you take all the gold in so many cooking contests! I tried doing the Pillsbury again this year – with lots of research, blah, blah, blah, and they still didn’t pick me. I thought my recipe was good but maybe it was too plain. I’m going to share this recipe with two pumpkin/chocolate loving friends. More followers for you! That looks really good. Made me want to go home and bake. Wow, what a creative recipe! wow this looks so delicious – perfect for fall! OMG! This is freakin awesome! The picture makes me sooo happy! OMG! every time I come here I’m always salivating over your yummy sweet treats, this one is another winner! The tart is wonderful, thanks for sharing! i just read on another blog about a pumpkin chocolate cheesecake… now this. i need to start baking right now. Wow! I love the idea of utilizing brownie mix for this. I have alot of recipes that use cake mix, but I never considered using brownie mix – GENIUS! Holy cow! just add coconut and oreos and i think you will have covered all of my favorite food groups!! :]] awesome – totally making this for my work friends tomorrow!!! Thanks for all you blog, xoxo! This looks SO bad for me but SO gooddd….Yum!! OH yum. 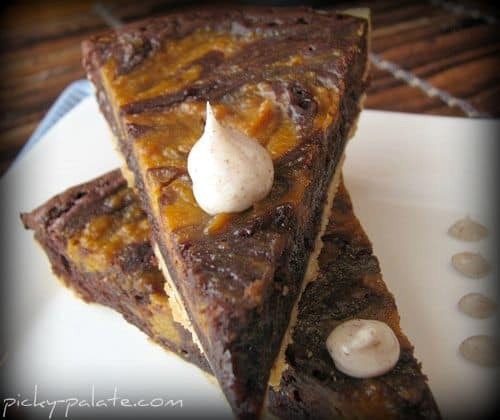 I love love LOVE pumpkin and chocolate together — love this tart!! Perfect fall treat! Oh my goodness! So, how are you not morbidly obese? I think I gained 5 lbs just going through all your yummy recipes, escpecially all the treats. I can’t wait to try some of them out. But really, what is your secret? You have way too many good recipes! I have a serious sweet tooth and pumpkin addiction, I can’t wait to make these for my Halloween party. Do you create all these recipes yourself? I have definitely found my new favorite recipe site! Anything with pumpkin in it makes me happy. I often add half a cup to my favorite Trader Joe’s brownie mix. Hey, a little bit of vitamin A never hurt anybody. This looks amazing…I have it bookmarked! Could this be made without the crust? It seems extraneous. That’s a fabulous recipe! Copying it right now!!! Jenny, I am amongst your biggest fans….. your recipes are sinful and delish – I say we write the food network and replace Sandra Lee with YOU! Now, we all wonder how you stay so thin with this stuff around! OMG! This looks absolutely gorgeous and so delish! Cheers! I am wandering if you can do this minus the tart part? Is it good just as pumkin brownies? I love that this looks so good and easy on top of it. I think I am going to make it right now! I love your blog and have made a lot of your recipes. Im making this tart and am a little confused. Its 2 brownie mixes – is that 2 mixes in one tart? Or does it make 2 tarts? I bake gluten free so with a gf pie crust, this is a great recipe for me to make! Wow – I really should read the recipe carefully. Just saw the first part where you clearly state 2 pans. Never mind! Have a great holiday.